There are many factors which influence the outcome of a prostate cancer patient’s treatment, and quality of care is by far one of the most important. Quality of care begins at the initial consultation and flows through planning and the radiotherapy process to the follow-up visits during recovery and remission. During the planning stage of radiotherapy, a CT scan will be scheduled. This vital diagnostic test helps lay the foundation for highly effective care. After a patient has decided to proceed with radiotherapy, he will be scheduled for a CT planning scan. The purpose of the scan is to provide the planning department with the vital insight needed to properly prepare for the upcoming treatment. The CT scan is a painless but very important x-ray procedure. It is used as a diagnostic and monitoring tool for a wide array of conditions, as it provides cross-sectional, 3-dimensional images of areas inside the body. For cancer patients, it means that the extensiveness of their condition can be more thoroughly assessed because the scan pinpoints the exact location and size of tumors. Once the CT planning scan has been performed, the resulting information is sent to the planning department. The radiation therapy planning department has the responsibility of identifying exactly how much radiation is needed and where that radiation should be administered in the body. One of the primary goals is to reduce the risk of any potential side effects of the treatment by minimizing how much of the body is exposed to the radiation. The results of the CT scan help make effective treatment planning possible. 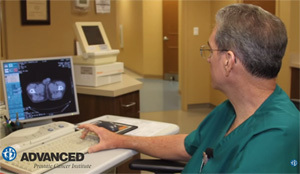 When it comes to the treatment of prostate cancer, exceptional, accurate planning proves vital to superior patient care and has a direct impact on patient outcomes. This is one of many reasons why patients make Advanced Prostate Cancer Institute their preferred center for receiving radiotherapy. If you have questions regarding prostate cancer, our board-certified team of urologists has the answers. To schedule a consultation or PSA test, please call (352) 507-0001 today.